Over the past few months, and especially during the holidays, my office became an unorganized disaster! Shelf organization was something I was in desperate need of... There was junk everywhere, and zero organization. Wrapping paper and ribbons were scattered all over the floor, boxes were piling up and I could not see my desk surface. Seriously I let things go... haha I knew that after the holidays I needed a serious deep clean. 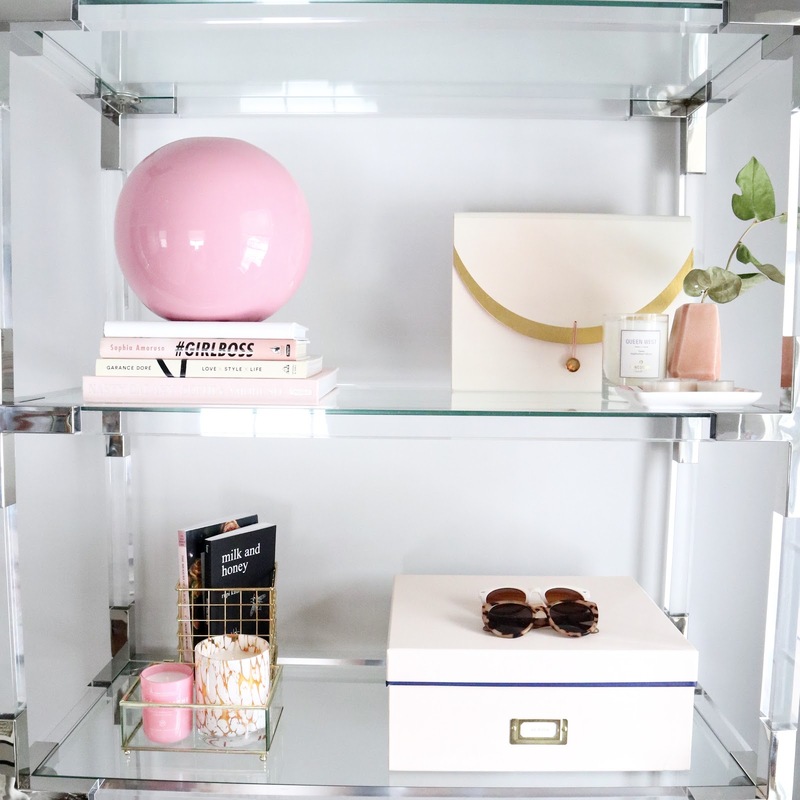 Once I got this beautiful lucite shelf all the plans fell into place. I love that it is lucite, so it keeps the room looking large, and it has plenty of shelves. I headed to HomeSense, aka my holy grail for stylish home goods, and picked up some essentials to get it all in order. Storage boxes? Check. Trays and containers? Check. And, obviously, a few pretty additions! 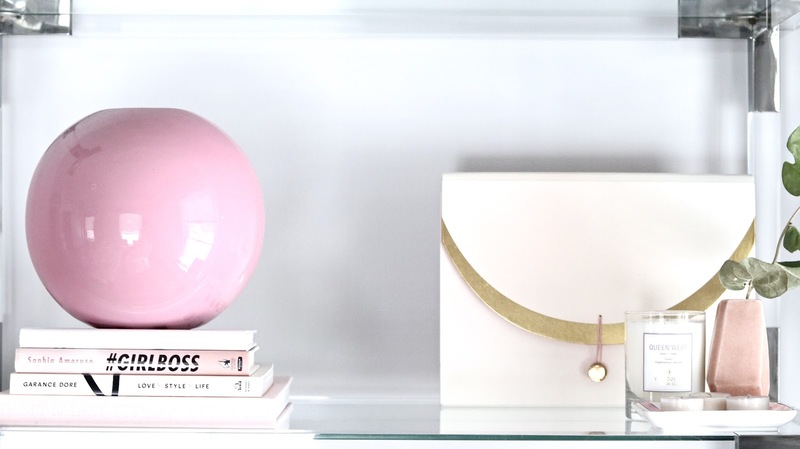 Styling a shelf can seem intimidating. What do you want to display? How can you utilize the space without it feeling crowded? And how can you actually use it to store things... and not just act as a decor piece. I took a weekend to tackle the project and I am already feeling so relieved and organized! It's amazing what a fresh, clean space can do. 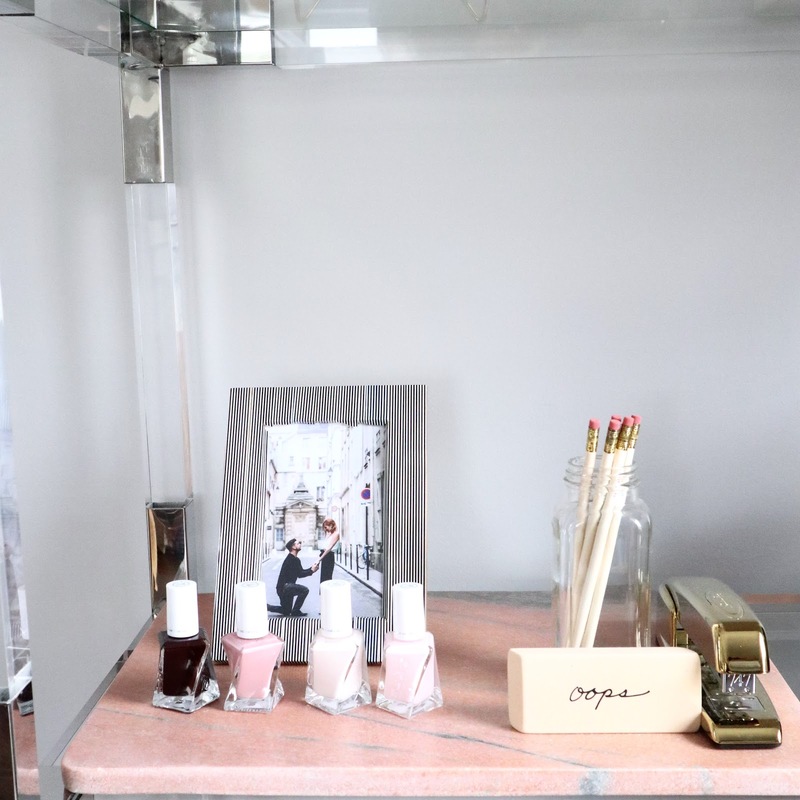 Here are 5 ways I styled the shelf to make it functional and stylish. I grouped like colours together to keep my colour palette clean and fresh. Pinks, gold, whites... you know me! Then I started placing them on the shelves in different ways. 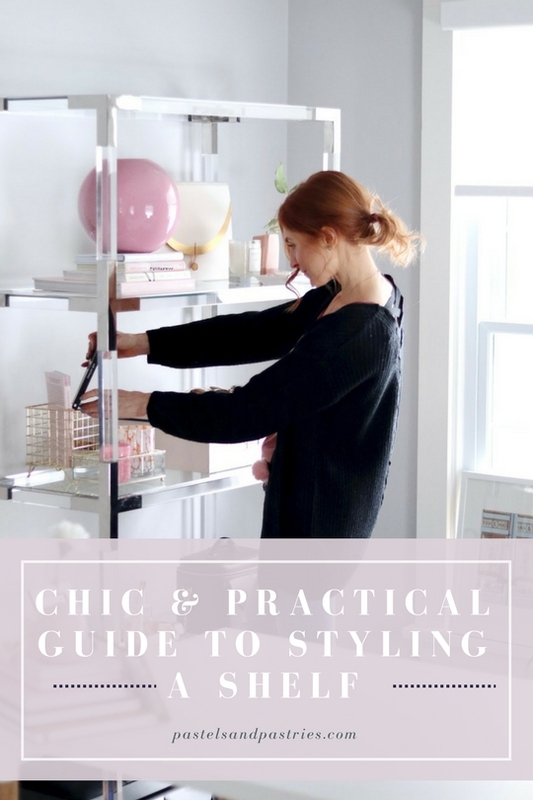 Styling the shelf with books first is a great starting point because it allows you to layer other items on top and around. And, keep in mind, you don't need to stick to the traditional stack or row! Turn some on their side, put some on an angle, display one of your favourite covers, and turn some around so you have a stack of all white spines. Create some interest with the pieces. Think about how you want it to look. Do you want the pile to gradually get smaller or do you want them all the same size? I had to play around with a few different set-ups. I had too much black beside each other, then too much pink. I kept the colours balanced by spacing the items out and taking a step back after I placed a few of them on the shelf. Keep in mind you don't want to overcrowd the shelf but you want it to be functional. Try bringing some objects closer to the front of the shelves, while having some higher objects in the back. Try layering necklaces over books, candles on top of trays, and photos in front of boxes. I had a bunch of blank papers, ribbons, and cards that I use for crafting but wanted to hide away. I bought some great storage boxes (glass for the things I wanted to display, and coloured to hide away some objects) to store and organize random things. Inside the box may be another story, but on the outside, it looks fresh, organized and de-cluttered. Also, using trays helps to keep things in order and looking organized. Since I was looking for practicality, I got some cute filing folders at Target to file away important documents. It looks good but it's serving a purpose, ya know? Since I pretty much reach for my camera daily I now house it on my shelf, in its bag. Right where I can see it and grab on the go! This is your space and you want it to be a reflection of you! Add some meaningful objects, like souvenirs, personal trinkets and anything that brings a smile to your face (i.e. : makeup, sunnies, etc.). Photos are another great addition. Whenever you look up you are reminded of beautiful memories. Add prints or quotes for whenever you need a little jolt of happy motivation! 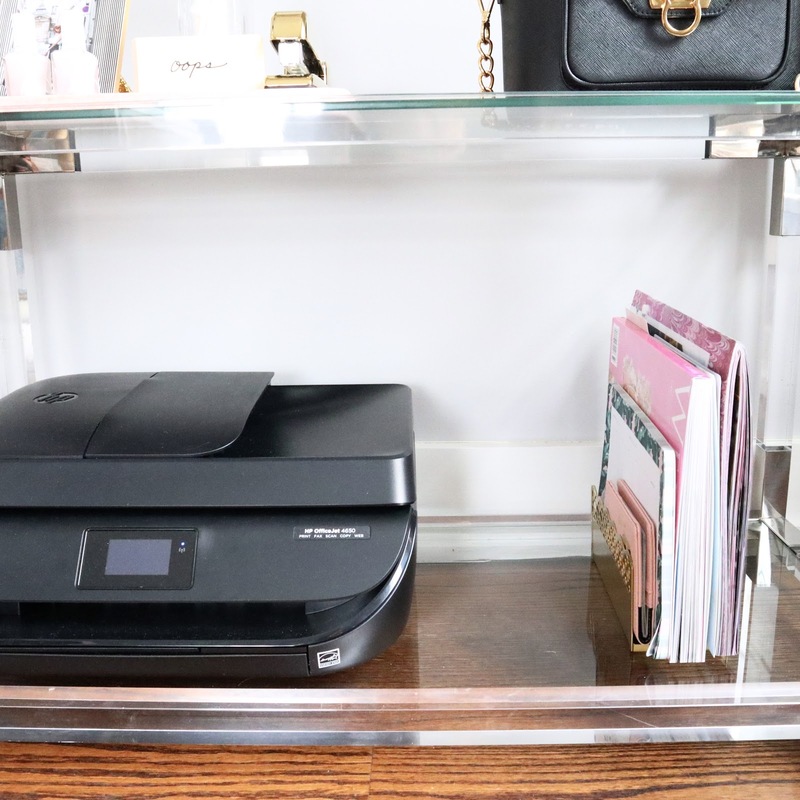 A printer is a necessity for most offices. I'm not going to put it away and bring it out every time I need it. It's just not practical! I now display it on the bottom shelf, which is actually perfect for me to whip around in my chair and grab the document! No time wasting here! 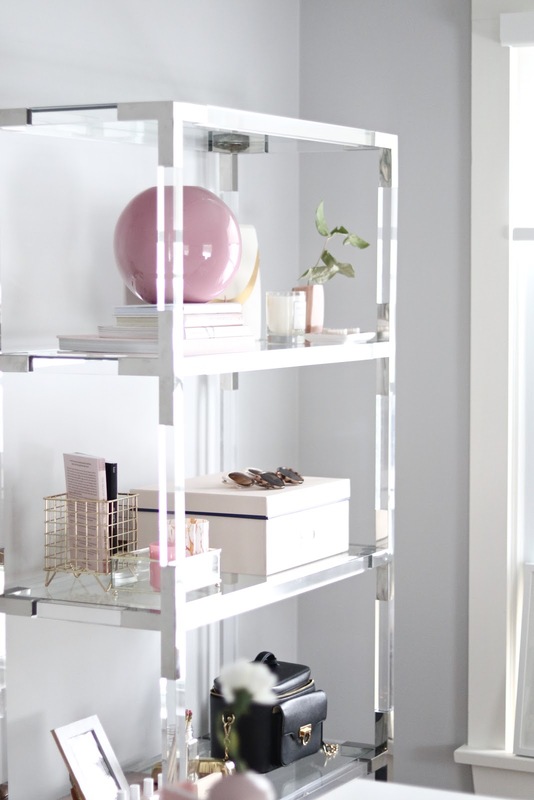 Do you have any tips for styling a shelf? I hope these help! Remember all spaces can be beautiful, and practical, too! 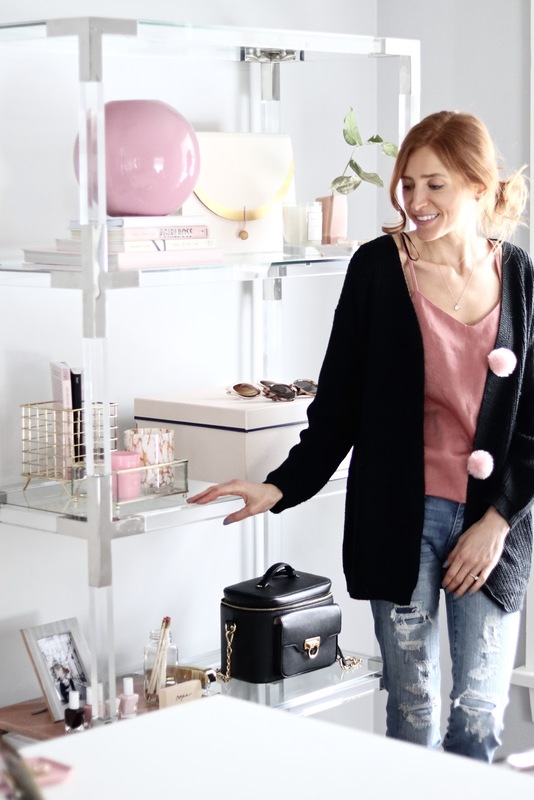 If you have any questions for the items on my shelf, leave me a comment! *This post was in collaboration with HomeSense. I love the wire baskets for storage! The pink pot is so pretty too. Shelfie twins! I love this bookshelf. I actually found it at Homesense with gold detailing. Sooo pretty.